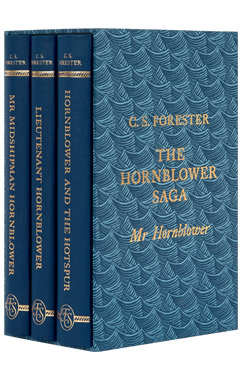 We have received some splendid news from the Folio Society regarding their new publication of the chronological first three Hornblower books – Mr Midshipman Hornblower, Lieutenant Hornblower and Hornblower and the Hotspur. The Folio Society is a privately owned London-based publisher, founded by Charles Ede in 1947. It produces illustrated hardback editions of classic fiction and non-fiction books, poetry and children’s titles. These three books have Introductions by Bernard Cornwell and are illustrated by Joe McLaren. The ‘Mr Hornblower’ set is three-quarter bound in cloth with cloth front boards printed and blocked with designs by the artist. 15 full-page black & white integrated illustrations, 5 chapter-head decorations and 13 maps across three volumes. Each volume is 9” x 5¾”. Cecil Scott Forester was born in Cairo to British parents in 1899. He studied medicine at Guy’s Hospital in London, but after leaving without a degree he turned to writing, and his first novel, Payment Deferred, was published in 1926. During the Second World War he worked for the British government writing propaganda to foster American support for Britain’s war effort, a post that took him to California, where he lived until his death in 1966. The author of more than fifty novels, Forester is best remembered for his series of twelve books and multiple short stories about Horatio Hornblower, an officer in the Royal Navy during the Napoleonic Wars. Two books in the series, A Ship of the Line and Flying Colours, were awarded the James Tait Black Memorial Prize for fiction in 1938. Bernard Cornwell, OBE, is a British author of historical novels. He studied at London University before joining the BBC, where he became the head of current affairs television in Northern Ireland. In 1979 he moved to the United States and pursued a writing career. Cornwell is best known for his Sharpe series (1981–2007), which traces the career of Richard Sharpe in the British Army during the Napoleonic Wars – a series directly inspired by C. S. Forester’s Hornblower novels. His other fiction titles include The Starbuck Chronicles (1993–6), The Warlord Chronicles (1995–7), The Grail Quest Series (2000–12), The Warrior Chronicles (2004– ), Azincourt (2008) and Fools and Mortals (2017). Joe Mclaren graduated with a BA in Illustration at the University of Brighton in 2003. He has worked for many book publishers, including Penguin, Orion and HarperCollins, contributing illustrations for titles such as Terry Pratchett’s Discworld series and J. K. Rowling’s Harry Potter books. His work for The Folio Society includes artwork for titles by Anthony Burgess, William Cobbett and a host of historical writers. He is also known for his editorial work in the Times and WIRED magazine, among others. McLaren most often uses scraperboard to create his images, a late nineteenth-century invention prized for its deep contrast and distinctive texture.